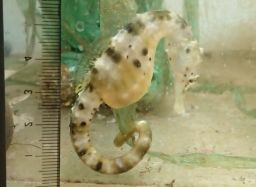 1) Sogabe, A., Takata, H. & Kato, S. (2014) Estimating the mode of egg production in the spotted seahorse Hippocampus kuda to establish efficient captive breeding conditions. Aquaculture Science 62, 199-201. 2) Tue, N. T., Hamaoka, H., Quy, T. D., Nhuan, M. T., Sogabe, A., Nam, N. T. & Omori, K. (2014) Dual isotope study of food sources of a fish assemblage in the Red River mangrove ecosystem Vietnam. Hydrobiologia 733, 71 – 83. 3) Sogabe, A. & Takagi, M. (2013) Population genetic structure of the messmate pipefish Corythoichthys haematopterus in the northwest Pacific: evidence for a cryptic species. SpringerPlus 2, 408. 4) Sogabe, A., Takata, H. & Kobayashi, Y. (2013) Ovarian structure and mode of egg production in the seaweed pipefish, Syngnathus schlegeli (Syngnathidae). 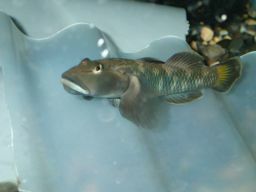 Ichthyological Research 60. 85 – 88. 6) Sogabe, A., Mohri, K. & Shoji, J. 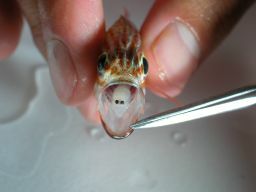 (2012) Reproductive seasonality of the seaweed pipefish, Syngnathus schlegeli (Syngnathidae), in Seto Inland Sea, Japan. Ichthyological Research 59, 223-229. 7) Tue, N. T., Hamaoka, H., Sogabe, A., Quy, T. D., Nhuan, M. T. & Omori, K. (2012) Food sources of macro-invertebrates in an important mangrove ecosystem of Vietnam determined by dual stable isotope signatures. Journal of Sea Research 72, 14-21. 8) Sogabe, A., Kawanishi, R. Takata, H. & Kobayashi, Y. (2012) Basic reproductive biology of the barbed pipefish Urocampus nanus (Syngnathidae) under laboratory condition. Ichthyological Research 59, 77-82. 9) Sogabe, A. & Ahnesjö, I. (2011) The ovarian structure and mode of egg production in two polygamous pipefishes: a link to mating pattern. Journal of Fish Biology 78, 1833-1846. 10) Tue, N. T., Hamaoka, H., Sogabe, A., Quy, T. D., Nhuan, M. T. & Omori, K. (2011) The application of δ13C and C/N ratios as indicators of organic carbon sources and paleoenvironmental change of the mangrove ecosystem from Ba Lat Estuary, Red River, Vietnam. Environmental Earth Sciences 64, 1475-1486. 11) Yamanaka, H., Sogabe, A., Handoh, I. C. & Kawabata, Z. (2011) The effectiveness of clove oil as an anaesthetic on adult common carp, Cyprinus carpio L. Journal of Animal and Veterinary Advances 10, 210-213. 12) Sogabe A. (2011) Partner recognition in a perennially monogamous pipefish, Corythoichthys haematopterus. Journal of Ethology 29, 191-196.